They fell in love in a boat. Who has time to think about what goes into a bedroom when your days are spent raising little boys and saving lives at a hospital? So when we got the opportunity to re-design our first ‘Room Makeover’, I did an emotional cartwheel (I can’t do a physical cartwheel) because who deserves a bedroom sanctuary more than a hardworking doctor and mother? We’re thrilled to be able to unveil this ‘bedroom for boaters’ here today as a little present to a wonderful family! At the start of the project, I got this text from the husband. I thought it was so funny! Clearly, this bonded couple laughs a lot. They have quick wits and warm hearts. They rowed crew at Dartmouth where they fell in love in a boat, and even today, they still make time to go out on the water. Whether on the Vineyard or the Chesapeake Bay, this couple loves being together, especially with their boys. Their bedroom needed to be casual enough that the whole family could climb into bed and read books, but polished enough to look like a special space for couple time. No TV in the bedroom was at the top of their list. To reflect their sense of style, we combined a traditional aesthetic with touches of coastal charm. Here’s what we did to pull it off. Because the room’s paint was relatively new, we decided to keep it! The wall color is Benjamin Moore’s Navajo White (OC-95) and is a shade that looks elegant no matter what…. Almost a candlelight color, this hue looks fresh yet warm during the day, and ladies, it makes you look great by night! ((*wink*)) For this project, it was especially perfect because it felt reminiscent of sand, and this gave a subtle nod to the coast (a fitting vibe for these two boaters!). 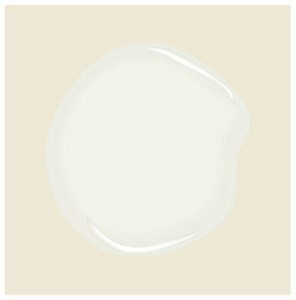 Always a classic, and a shade of white that works almost anywhere, the trim color is Benjamin Moore’s “Decorator’s White”. The focal point of the room, this inherited rug was sentimental and needed to stay. Knowing we had to keep it, we thought, “How do we create a classic room that’s inspired by the water without it feeling nautical?” It’s a nuanced balance but so easy to replicate! We focused on the color palettes of the sand and sea. The neutral Belgian linen curtains lend a wind-swept quality to the space, and we made them unique with a pretty blue and white trim. The bedding, in contrast, pops with subtle shades of blue inherently touched by water because the flowers on the duvet and shams look like they were painted with watercolors. 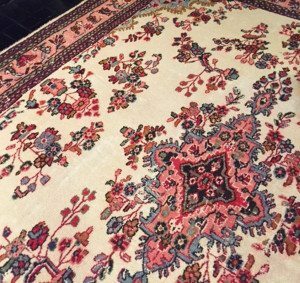 It will be hard to find a rug exactly like the one they own (we tried! ), so here is a suitable choice when recreating this look in your own bedroom. The accessories in this room are what effectively tie the family’s traditional aesthetic with the coastal vibe we wanted to create. The accent pillows feel fresh and beachy – we even included a pillow with a boat silhouette! And as a twist on the tradition of monogramming bedroom pillows, we found these with the couples’ whimsical initials. The blue sea kelp-inspired lamp has a playful dialog with the sheeting trim that also looks like watery sea plants, and the horned picture frame lends a textured touch reminiscent of blue coral. Even the bedside table lamps have a wave inspired motif while the ceiling light almost looks like an anemone. A tiffany box and bedside vases (that double as cups) introduce different shades of blue inspired by the many colors of the ocean. And what better place to put your bobbles than a little decoupaged shell tray?! We cheated the asymmetry of the windows by only hanging the curtains on the outer edges, and by strategically placing identical bedside tables at the precise spot, the bed now seems at home in the space and the room feels balanced. Isn’t it funny how subtle decisions can fool the eye?! To make the unusually high window make sense, we removed the love seat and replaced it with a dresser that’s the correct height. Curtains on either side soften the elevation and speak to the windows across the room. Another problem we came across was the lack of space for seating. With no room for an armchair, we went with a faux bamboo bench for a beachy touch to contrast the wooden bedroom furniture. And don’t miss the window seat! The perfect place to curl up and read, we added soft cushions to make this spot inviting. Lastly, the bed is an heirloom and we loved it, so all of the furniture we selected compliments its wood tones and lines without the room looking like a “bedroom set” – bedroom sets are a major design don’t! The floor plan in your house will likely be different from the one pictured here. That’s not a problem! Right here we show you how easy it is to reconfigure everything from this beautiful bedroom in your own space. At last, you can stop making costly design mistakes! Here is a rendering just for you, a scaled printable floor plan with elevations, and a buying guide of where you can buy every item in this room. We hope this family enjoys years of love and laughter in their new room…. P.S. Is there a room in your house that you tirelessly tried to make beautiful, but something (or a lot of things) went wrong? Is looking at the space just a frustrating reminder of the time, energy and money you wasted (or worse, a reflection of your “design paralysis”)? It’s okay! You never have to worry about making the same mistakes again. Send your best design blunder to info@annetollett.com and we’ll take a look. If your room is chosen we’ll redesign it for free and feature the transformation on our site! Besides, what’s better than a great before and after photograph? !